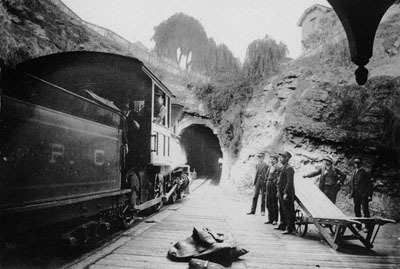 The Mission Tunnel (SPC Tunnel #8) is a 927 foot tunnel first bored in 1876 when the South Pacific Coast Railroad took over management of the Santa Cruz & Felton Railroad. 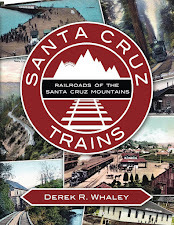 Facing increasing criticism from the local government over the use of the train tracks that passed down Pacific Avenue, the South Pacific Coast decided that a short bore through Mission Hill under the Santa Cruz Mission would be a viable bypass option. The track would then continue down a Chestnut Street to Santa Cruz Depot rather than down the more popular Pacific Avenue. Neither portal were much photographed. The northern portal was hidden in a hillside in the Portrero District while the southern portal discretely appeared in the wall of a cliff beside what was originally Cherry Street and is now Chestnut Street. An old photograph of the southern portal shows its wood-planking and simple design. 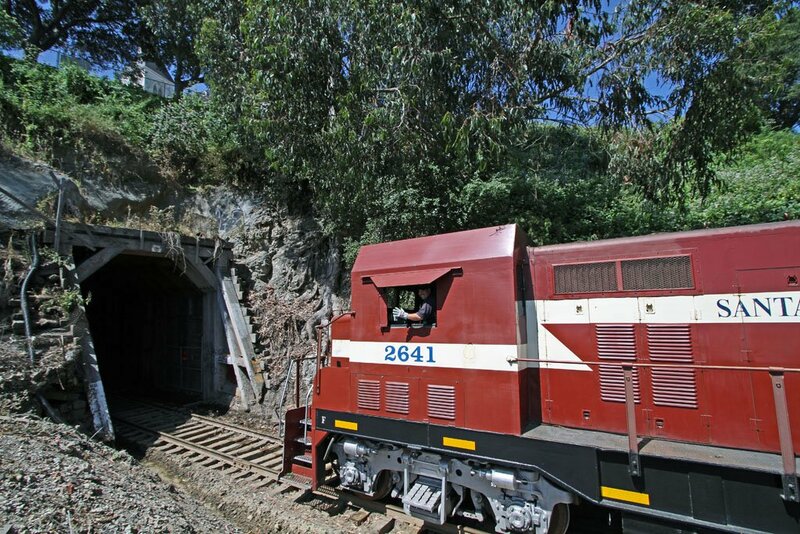 It was a utilitarian tunnel with no aesthetic value, but it has served its purpose and is the only remaining tunnel of the South Pacific Coast line that has remained in continuous use since it was first built. The southern end of the portal served as the original station for the South Pacific Coast line until the more expansive Southern Pacific freight yard and station were created on the other side of Laurel St.
Little has changed since the first tunnel was built. 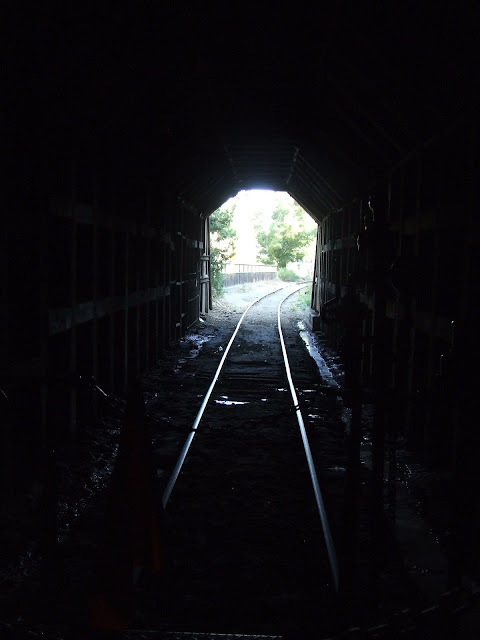 The tunnel was enlarged to support broad-gauge trains around 1903 and the timbers have been replaced from time to time, but the tunnel never was built of cement like the others and still uses the original broad-gauge tracks first laid around 1904. The interior of the tunnel is unlighted and dark, with wood beams holding up the hill and a single track running through the middle. Below, it can be seen heading toward its south portal on Chestnut Street. The tunnel is now gated at night and when not in use due to vagrants often using it at night. It is also constantly wet with dew and puddles from rain, as this photograph makes clear. The photograph below shows one of the Big Trees diesel engines entering the northern portal. No historical photographs of this portal seem to exist. The tunnel had some of the lowest clearance along the Mountain Route and still is barely above the roof of the train. The southern portal of the tunnel is buried inside the cliff, attempting to hide from the public yet so obvious. A house is immediately beside the tunnel and another is above the tunnel on the cliff. 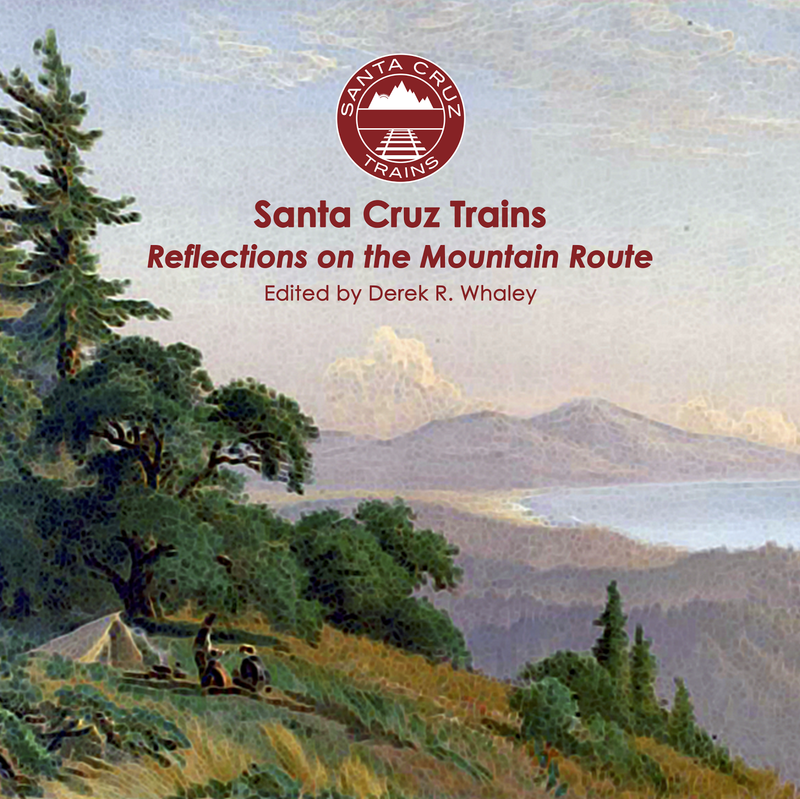 This site used to serve as the South Pacific Coast Santa Cruz station but nothing of that time survives. The tracks depart the tunnel and merge seamlessly with Chestnut Street near Green Street. They then continue together until crossing Laurel St., at which point they go their separate ways. A small flag-stop outside the south portal on what was once Park Street was used from the early 1900s until the streets were realigned in the 1950s. I was actually wondering for a while if that photograph was of the southern portal, but the place I copied it from said northern. The cliff structure seems all wrong for the south but I suppose things have changed a bit in the last 100 years. It is now corrected. Its nice to see all this info consolidated in one place. The first and last picture on this page are taken from almost the same vantage point. That thing hanging down on the right side of the black and white photo is some of the "frosting" on the fancy Victorian styled train shed. If you need any info regarding the details, I work for Roaring Camp and have lots of books/knowledge of the subject and the history.